“Why Are We Bringing Him Along, Again?" Will Inquired, Of The World In General As Well As His Sister. Cecily Put Her Hands On Her Hips. "Why Are You Bringing Tessa?" 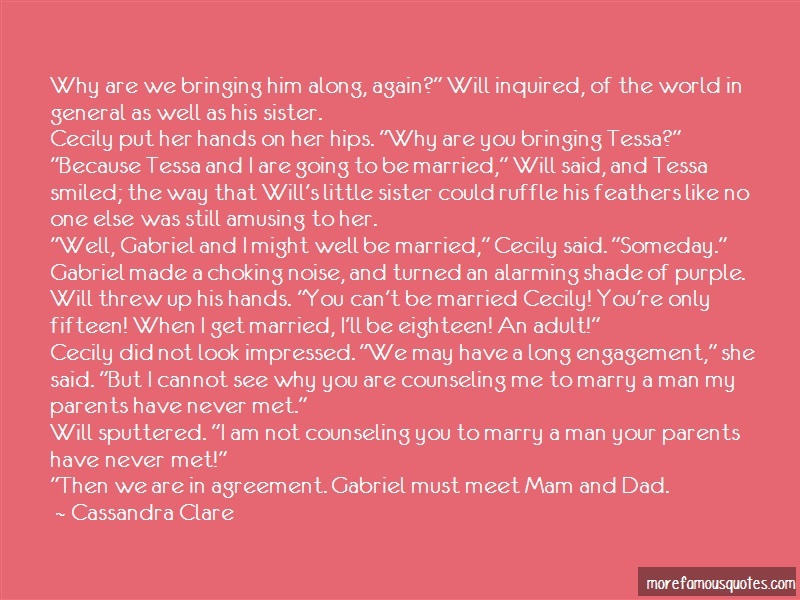 "Because Tessa And I Are Going To Be Married," Will Said, And Tessa Smiled; The Way That Will's Little Sister Could Ruffle His Feathers Like No One Else Was Still Amusing To Her. "Well, Gabriel And I Might Well Be Married," Cecily Said. "Someday." Gabriel Made A Choking Noise, And Turned An Alarming Shade Of Purple. Will Threw Up His Hands. "You Can't Be Married Cecily! You're Only Fifteen! When I Get Married, I'll Be Eighteen! An Adult!" Cecily Did Not Look Impressed. "We May Have A Long Engagement," She Said. "But I Cannot See Why You Are Counseling Me To Marry A Man My Parents Have Never Met." Will Sputtered. "I Am Not Counseling You To Marry A Man Your Parents Have Never Met!"